As a lad, I was brought up with bikes by a bike-mad dad and lots of similar uncles, so I was used to all the petrol pumps in Prescot and the surrounding district. In the 1940s and 50s we had two in the town, Saggerson’s and Clegg’s. Clegg’s had a laundry and a garage fronting the business. It had been the centre of motorcycling before the war, but was still in existence when I left the area for National Service in the late 1950s. The only photo I can find shows my dad’s lorry refuelling there. I believe it dated from the First World War, with solid tyres and oil lamps, and Dad was expected to drive it to Liverpool and London on a regular basis. 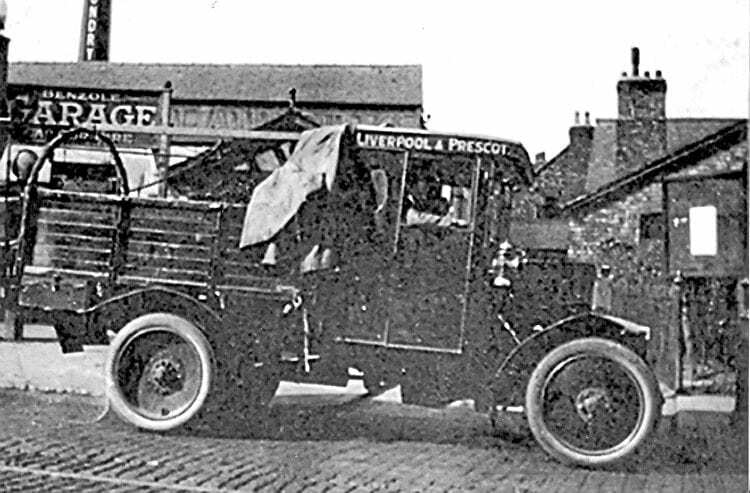 Another picture from the history books as the old lorry that the writer’s father used to drive stops to refuel at old-fashioned pumps in Prescot, Lancashire, many years ago. My main memory, though, is of Jack Welsbey’s Station Garage by the railway bridge in Rainhill, which sold Cleveland Discol. Jack rode factory Scotts on the Island in the mid-1920s, but he was also a successful sand and speedway rider before the war. He was a fund of racing tales, and kept me and the other young lads spellbound on many a winter night. Long before I was old enough to ride, he infected me with the Scott virus, and was instrumental in getting me a 1929 Scott for £1 10s to ride in the fields when I was 14. The draughty little shed and office was a haven for lads like me, huddled round a stove on a dark winter’s night. Happy days!